For most Lehigh-owned Windows computers, Personal and Departmental network file storage areas are connected automatically. This is also true for users accessing virtual software -- files are opened and saved using the Windows file system. Many users though, aren't familiar with locating network storage spaces, or how they look at Lehigh. The pictures below show some of the easiest ways to find these locations, in order to access your files on the network. To access your Personal Network space from macOS, see these instructions. Find the Computer or This PC icon on your desktop. If your desktop doesn't show it, look for one of the File Explorer icons, or the File Explorer menu, and go to This PC from there. 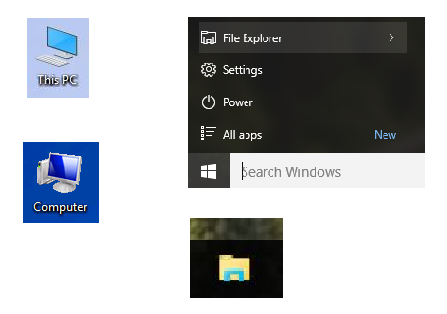 In a File Explorer window, you can click on This PC ('Computer' in Windows 7). Once you're in the This PC view, you'll see any drives connected to the system, including USB drives, and network drives. Your Personal Network Storage will be labelled with your username, and ends with an H:. Departmental storage will be labelled with your stem (college, etc. ), and ends with an I:. Double-click these to look inside. If you don't see these, you'll need to get them connected first -- follow instructions in Access Personal Network Storage in Windows or Access Departmental Network Storage on Windows to connect them manually. When opening and saving files from within programs, you'll see dialog boxes of a couple of major types. These are best navigated by clicking This PC first, and then finding your way from there, sometimes by scrolling down to your network drives. In Microsoft Office applications, like Word, Excel, PowerPoint, and Access, the programs have their own dialogs for opening and saving files. Here, clicking Browse will take you to a regular Windows dialog box. Note though, that under the program's dialog, the This PC view shows your home server and home share, just as in the network drive reference, and clicking the arrow allows navigation. Virtual Software -- If you're accessing Windows via the VMware Horizon client, or the Citrix Receiver, the default storage location for your files is in a folder _within_ your network storage space called 'VirtualFiles'. You'll see some folders there for the preferences for Windows programs ('AppData'), but also 'Desktop', 'Documents', 'Pictures' and 'Downloads' folders, just as you'd have on your local desktop PC, if you've saved files from within one of those environments.